In just a decade’s time, the smartphone has become the anchor for millions of people’s daily lives. And in that same time, the entire market for those devices has coalesced around two companies. While the the race among companies that make smartphone hardware is still competitive, the battle for smartphone platforms has long been done and dusted: You can use Apple’s iOS, or Google’s Android. And as this chart from Statista shows, that’s not changing anytime soon. 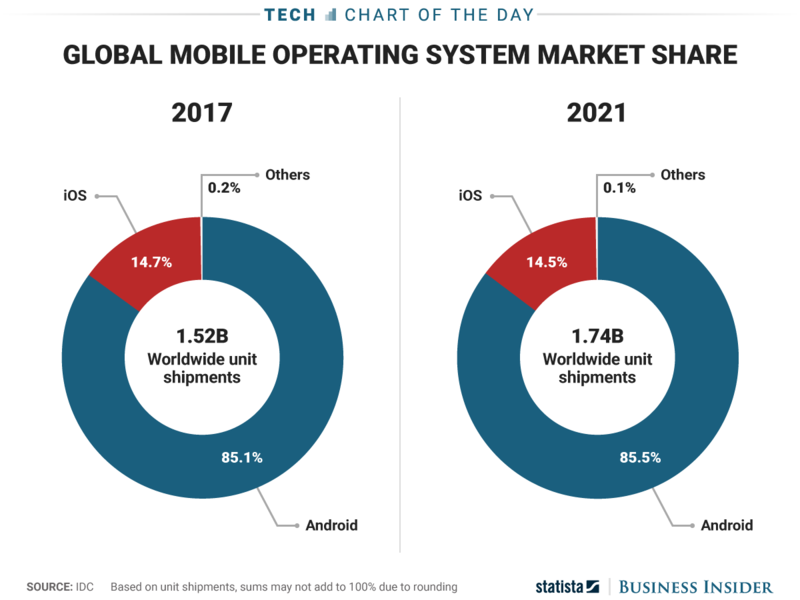 A recent forecast from IDC said there’ll be effectively no change in the current smartphone power structure in the next five years — iOS will hold a big chunk of the high-end with about 15% market share, while Android will have everything else. IDC says there will be micro-changes within that structure — the average selling price of an Android phone is expected to fall under $200 by 2021, for one. But with phone sales slowing, it’s hard to see any mobile players going out of their way to build a full-on competing platform, instead of just making an app or device within Apple and Google’s confines. Instead, we may have to wait until augmented reality, virtual reality, or whatever it is that comes after the smartphone for another company reach this sort of constant presence in people’s lives.